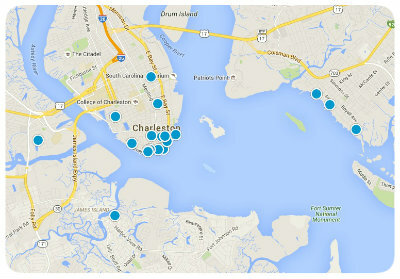 Surrounding the famous historic district of Charleston, South Carolina are the diverse and beautiful Barrier Islands. Each of these islands has its own unique character and history, and all are located within a 20-mile radius of the city. With most of these islands accessible by car, the various neighborhoods located on them are the perfect place to buy a home for both commuters and families. Homebuyers will love the variety of real estate options available on these islands, with a mix of new and old single-family homes, resorts, plantation homes, and beachfront condominiums. The many unique neighborhoods and communities of the Barrier Islands make it easy to find the perfect home to suit your tastes, style and budget. Whether you are interested in a historic home on the popular Sullivan’s Island, or looking for a brand new condo on Folly Beach, you are sure to find it on one of these lovely islands. Each island has its own feel, and this diversity makes it possible to pursue a variety of interests, from golfing, to wildlife spotting, to shopping and dining. The seclusion of some of these islands also provide those searching for a quiet community with a safe haven, away from the bustle of Charleston, but still within reach of all of its impressive amenities. Living on an island may seem like a crazy dream, but the many homes offered on the Barrier Islands can make it a reality. For more information about buying a home on the Barrier Islands of Charleston, South Carolina, please do not hesitate to contact us today! Breathtaking! It is the word that comes to mind as one drives up the Connector Bridge and beholds the salt marsh, the Intracoastal Waterway, the beach and ocean surrounding the Isle of Palms, South Carolina. And the sensation is not just the first time one sees it, but also every time in every season! The Isle of Palms, an Atlantic barrier island, has prided itself on being a family beach that is the perfect blend of approximately 5,000 fulltime residents and 20,000 to 50,000 investment owners and visitors who make it their home and destination. In 2002, the City was the first in the State of South Carolina to achieve the Blue Wave Designation from the Clean Beaches Council who recognizes environmentally well-managed beaches. The city has successfully kept this designation every year since. The Town, incorporated in 1817 as Moultrieville, did not allow lean-tos or shacks then as now. At that time lots were required to have a minimum of ½ acre and the same is true today. Sullivan’s Island is unique in that the beachfront lands which have accreted over the years, are owned by the Town and held in a perpetual easement by the Lowcountry Open Land Trust protecting the natural environment along the Atlantic Ocean. This Island has a long military history of protecting the harbor from invaders and there are many wonderful histories which capture those stories. Remnants of the military are abundant in now privately held military housing; even former fortifications are now single family residences. Many of these historic homes have withstood the test of time and ravaging weather. The Town of Kiawah Island, was incorporated by the State of South Carolina on September 13, 1988 and operates as a Mayor-Council form of government. The Town Council is composed of a Mayor and four Council Members. The Mayor is the chief administrative officer of the Town. The Town Administrator provides support and advice to the Mayor and Council and runs the day to day operations of the Town. The Town provides services to its property owners and visitors including, but not limited to: public safety; street and drainage maintenance; solid waste disposal; planning and zoning administration; municipal court administration; beach maintenance and safety; communications and wildlife management. The annual budget serves as the guide for the Town of Kiawah Island’s financial planning and control. The Town’s operations are funded by business license revenue, franchise fees, aid to subdivisions, accommodation taxes, solid waste fees and other miscellaneous revenue. Unlike most municipalities in South Carolina, the Town of Kiawah Island does not levy property taxes to its residents. To learn more about the Town and its operations, please visit the website at www.kiawahisland.org. Welcome to Seabrook Island, a private welcoming oceanfront community just miles from historic Charleston, SC. Completely immersed in natural splendor, the coastal barrier island is home to lush maritime forest, serene marshes and pristine beaches. With each leisurely day, Club Members and their guests enjoy two championship golf courses, a world-class tennis center, horseback riding, a brand new beach club and many more amenities. Seabrook Island – Make It Uniquely Yours.